Copy only added and modified files. Differential backup (differentiated backup) is a type of file backup, when not all the source files are copied, but only that are new and modified since the previous full copy was created. It is something between full backup and incremental backup. This type of backup is cumulative, i.e. each next copy contains all new/modified files since the previous full backup was created. Like any other, this type also has its advantages and disadvantages. Conclusion: Create a Differential backup in case the amount of original data is large, the files in the source folder are not modified too frequently, and the simplicity and speed of file restore is critical for you. Differential backups are quick enough if the accumulated changes since the creation of a complete copy are few. The optimal frequency of creating a Differential backup is 1 time per hour if the source files are changed frequently, and 1-2 times a day if the files are edited rarely. Install Exiland Backup and launch it. After launching, click the button at the top to create a new task, enter the task name, e.g, "My Projects", and click Next. Select the "Differential" backup type on the next screen of the wizard. Exiland Backup screenshot. Selection of the type "Differentian". 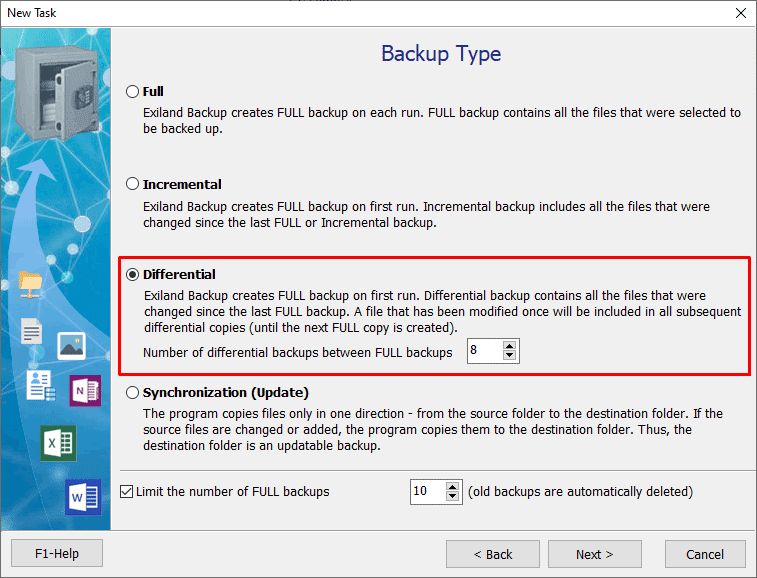 After selecting the backup type, you can limit the number of full backups below, so that the oldest backups are automatically deleted before creating a new full backup. This setting saves disk space. Also, you can limit the number of differential backups between full ones. When this limit is reached, the next full copy will be created. When selecting a template for the name of backups, you can add a line, for example, " (differential)" for differential copies so that they can be easily distinguished from other archives. When the task is created, you do not have to wait for the start time - you can run the task manually by clicking the Run button on the panel at the top. © 2003–2019 Exiland Software. All rights reserved.